To respect my customer’s privacy I never share the residential locations of my firebowls. 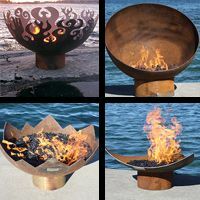 But there are many Sculptural Firebowls you can view in person at galleries, showrooms, hotels, restaurants and churches. I advise calling ahead to see what is currently in stock if you plan to make a longer trip.